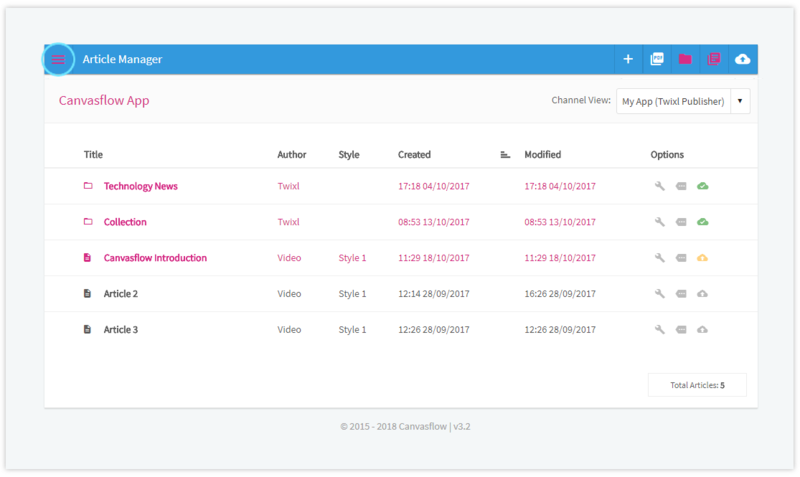 Canvasflow supports the Twixl Hamburger Menu making it simple to add and amend hamburger menu items for each publication connected to a Twixl App. Log into your Twixl Distribution Account and select the appropriate app. From Application Home select the drop-down and choose 'Edit Application'. Scroll down to 'Hamburger Menu'. Check the box 'Use Hamburger Menu'. From the Hamburger Menu options page select 'Create Hamburger Menu item'. Collection Link: Link to specific collection using the drop down menu. Placeholder: Allows an image to be added, such as a header image for the hamburger menu. To reorder the items in the Hamburger Menu click and drag on the move icon found next to each item. The new order will be immediately reflected in your Twixl app. All changes made to the hamburger menu will immediately be reflected in your app, without the need to publish.